The Sinica antenna is created from FR4 materials (a fire-resistant composite material made out of woven fiberglass cloth with an epoxy resin binder) and new dielectric constant laminate substrates. Antenova says its new antenna is designed for mobile platforms and devices such as drones and wearable electronic. Based in Hatfield, United Kingdom, the company says that its antennas are always used within a customer’s design, and that Antenova provides its customers with technical support during the design, integration, and testing phases. 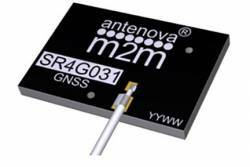 Earlier this year, Antenova announced three new families of antennas for the fast growing M2M, wireless and Internet of Things sectors. Sinica belongs to the lamiiANT family of new antennas for these market sectors.